Size: 4.3" x 2.5" x 0.40"
The TI-108 was introduced already in 1986 and we are positive that the internal construction was changed from time to time. The featured calculator was manufactured in March 2000 by contract manufacturer Nam Tai Electronics, Inc. in China. 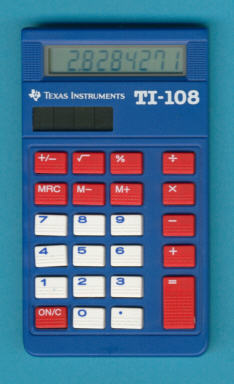 Dismantling this TI-108 reveals a typical design of a calculator developed in the 1990s. The single-chip calculator circuit is bonded directly to a high-quality printed circuit board (PCB) while the keyboard makes use of a much simpler Phenolic PCB. We know a similar design e.g. with the TI-15 Explorer. (1st design) C-0888 Based on TI-1706 II Compal Electronics, Inc.
C-0191 Based on TI-1105 Inventec Corporation. (3rd design) I-1194 Smaller solar cells Inventec Corporation. (4th design) N-0300 Printed TI logo Nam Tai Electronics, Inc.
(5th design) S-0804 With 3V backup battery Inventec Corporation. with 1.5V backup battery Kinpo Electronics. © Joerg Woerner, March 5, 2009. No reprints without written permission.